Part of $34.8 million investment by the company through a partnership with Minnesota Equity Fund and Cinnaire to help connect people in need with affordable housing, health care and supportive services. L to R: Earl Poleski, executive director, MSHDA; Mark McDaniel, president & CEO, Cinnaire; John Hayhoe, Supervisor, Delhi Township; Tim Hovey, Hovey Construction; Michigan State Senator Curtis Hertel; Dennis Mouras, CEO, UnitedHealthcare Community Plan of Michigan; and Serenity Lay and Scott Beltz, Medallion Management celebrate the opening of Prestwick Village a new 66-unit affordable-housing community with supportive services in Holt that will serve individuals and families, including people with disabilities and veterans struggling with homelessness. UnitedHealthcare was the largest investor in the new development, providing $8.5 million in equity through a partnership with Cinnaire and the Minnesota Equity Fund (Photo: Nick Azzaro). UnitedHealthcare is investing $18.3 million to help build two new affordable-housing communities in Hart and Oak Park, Michigan. The announcement was made at a groundbreaking ceremony for Jefferson Oaks in Oak Park, where community leaders and investment partners celebrated the start of construction for the 60-unit mixed-income community. UnitedHealthcare is investing $14.6 million in the Oak Park development. Cinnaire is providing a $2.3 million permanent loan to the project. Jefferson Oaks, developed by Community Housing Network Inc. (CHN), is being built on the site of a vacant school building and campus, which will be transformed into 20 apartments and eight new townhome-style buildings with an additional 40 homes. Twenty-one of the apartments are set aside for supportive housing. When completed in 2018, the new community will include on-site support services and amenities such as a community room with a library, computer lab and meeting space, and a playground. UnitedHealthcare also announced a $3.7 million investment in Woodland Place Apartments in Hart. The new 24-unit apartment community, developed by Gryphon Group LLC and Oceana County Housing Commission, will include 12 units for people living with special needs and struggling with homelessness. The development is being built to U.S. Green Building Council LEED environmental standards. West Michigan Community Mental Health will provide supportive services and case management for residents. Woodland Place Apartments will open in 2018. The Michigan State Housing Development Authority (MSHDA) approved the use of Low Income Housing Tax Credits for the new developments, with Minnesota Equity Fund (MEF) and Cinnaire securing the equity funding from UnitedHealthcare. MEF and Cinnaire support community stabilization and economic development through partnerships with investors and mission-focused organizations through the use of federal tax credits and by providing creative loans, investments and best-in-class services to partners. Last year, UnitedHealthcare invested $16.5 million in two new affordable-housing communities in Ypsilanti and Holt. 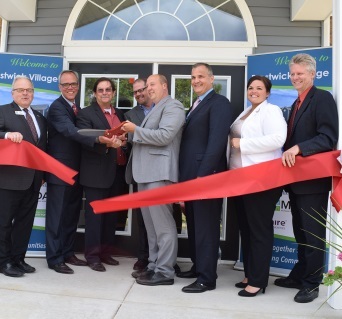 A ribbon-cutting celebration was held today for one of those developments – Prestwick Village in Holt, a new 66-unit affordable-housing community with support services that provides new housing opportunities for individuals and families, including veterans struggling with homelessness and people with disabilities. UnitedHealthcare invested $8.5 million in Prestwick Village, which was developed by Gryphon Group and constructed by T.R. Hovey Construction LLC. UnitedHealthcare has provided more than $350 million in financing since 2011 for 56 housing development projects in 14 states, creating more than 2,700 affordable-housing units. This includes $34.8 million in four new affordable housing communities in Michigan. Cinnaire is a full-service community development financial partner that supports community stabilization and economic development by developing and nurturing partnerships with investors and mission-focused organizations. We provide creative loans, investments, and best-in-class services to partners. For more information visit www.cinnaire.com. MEF is a subsidiary of the Greater Minnesota Housing Fund (GMHF), a non-profit Community Development Financial Institution. GMHF provides loans, equity investments, grants and technical assistance to create affordable housing in Minnesota. MEF provides equity investments in Minnesota and the Great Lakes region. MEF is a strategic partnership between GMHF and Cinnaire. UnitedHealthcare is dedicated to helping people nationwide live healthier lives by simplifying the health care experience, meeting consumer health and wellness needs, and sustaining trusted relationships with care providers. The company offers the full spectrum of health benefit program for individuals, employers, military service members, retirees and their families, and Medicare and Medicaid beneficiaries, and contracts directly with more than 1 million physicians and care professionals, and 6,000 hospitals and other care facilities nationwide. UnitedHealthcare is one of the businesses of UnitedHealth Group (NYSE: UNH), a diversified Fortune 50 health and well-being company. For more information, visit UnitedHealthcare at uhc.com or follow @myUHC on Twitter. View more related photos and videos online at BusinessWire.